Advent is a time of waiting; waiting for the coming or arrival of something. This is the season when “advent” is waiting for the arrival of Christmas, when we celebrate the fact that Jesus was born as baby and entered our world. For most, it is a time of joyful anticipation, mixed with frazzled busyness. But for many of us who have faced the death of our child, it is a time of waiting for the season to just… be…over. There are so many painful reminders of who we are missing, and painful reminders of what will never be. We are also waiting to be reunited with our child, and that can’t seem to come soon enough. I remember in that first year after Becca died, telling God to just kill me, so I could be done here. Even though I had four other children, I just couldn’t get past the pain of having Becca gone, to be able to enjoy and love the ones who were still here. Most of us are not suicidal. We just don’t want to live any more. I believe God knew from the very beginning of time that we would struggle with feeling so hopeless in our grief, and He did something about it. 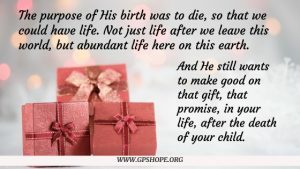 Even though the Christmas season is all about Jesus entering the world of the humans He created and becoming one of us, the purpose of His birth was to die, so that we could have life. 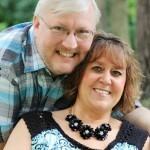 Not just life after we leave this world, but abundant life here on this earth (John 10:10). And believe it or not, He still wants to make good on that gift, that promise, in your life, after the death of your child. 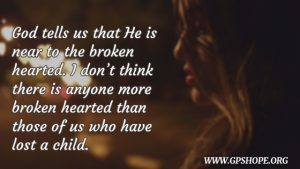 God tells us that He is near to the broken hearted (Psalm 34:18). I don’t think there is anyone more broken hearted than those of us who have lost a child. But no matter how broken you are today, tomorrow always promises new hope. Because it may have looked like Jesus came as a sweet little baby, and He did. But he also came as a mighty King! We know He didn’t come as an earthly king to overthrow an earthly government, but to overthrow Satan, the spiritual ruler of this world, and to nullify the eternal effects of the horrible things Satan puts in our individual lives while we are here on this earth. Jesus is not a ruthless king, although we might think so after the death of our child. Yes, He came to right the wrongs, but not the way we often think. (Just like it wasn’t the way the disciples thought.) He didn’t come for a temporary earthly fix. He came to make things permanent, for all of eternity. He is the Alpha and the Omega (Revelation 1:8) which means He is the beginning of all things and He is the end of all things. Not only does He have the final word, He IS the final Word! I want you to think about this. Jesus, our King, has never lost a battle that He was brought into. His strategies will often be different than ours, and there may be times we don’t like the playing field we find ourselves on, but when we bring Him into our battle, He always has the final Word, and the final victory! There is a song that has been around for many years that says, “Sometimes He calms the storm, but sometimes He calms His child.” Earthly kings might be able to control some physical things here and there, but only King Jesus can bring His Kingdom inside of us. For instance, He can bring peace to our shattered hearts. That is a much greater rule than any earthly king or kingdom! Jesus is also our shepherd. John chapter ten talks about the thief (the enemy who is after the sheep) who comes to steal, kill, and destroy them. The enemy attacks the flock and scatters it. 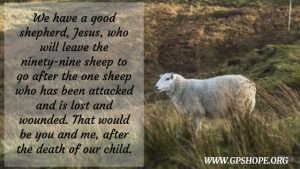 But we have a good shepherd, Jesus, who will leave the ninety-nine sheep to go after the one sheep who has been attacked and is lost and wounded. That would be you and me. Psalm 23 says, “The Lord ADONAI is my shepherd… He restores my inner person (my soul)” (CJB). And the best part is that it doesn’t matter how far away you are from God in your anger or unforgiveness; God has peace for you. How do I know this? He tells us in Isaiah 57:19 and Ephesians 2:17 that there is peace to those both far and near. How about another promise from the One who has the final word? Jeremiah 33:6 states, “I will heal my people and will let them enjoy abundant peace.” He will heal your wounded shattered heart. Maybe not as soon as we want, and not even a complete healing here on this earth, but He will do it! Jesus is our shepherd, to guide us into a place of peace; a peace that doesn’t make any sense after the death of our child. But their death isn’t the end, it is not the final word. Peace is being extended to us. Our part is to let go of what we are carrying that keeps us from accepting His gift of peace. It is an exchange. We give Him our fear, anger, doubts, bitterness and so on, and He gives us peace. Sounds like a pretty good deal on our end! Most of us are familiar with the promise in the book of Revelation about God wiping all the tears. But did you know it is because He is our shepherd? It is found in chapter 7, verse 17 and says, “For the Lamb at the center of the throne will be their shepherd; he will lead them to springs of living water. And God will wipe away every tear from their eyes,” (NIV). 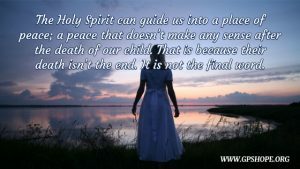 Prayer: Jesus, thank you for having the final word in my child’s life and in my life. And thank you that one of those final words is peace for my life. Help me to let go of the things that are keeping me from accepting that gift of peace. Amen. This was taken from the book Hope for the Future: An Advent Book for Bereaved Parents. 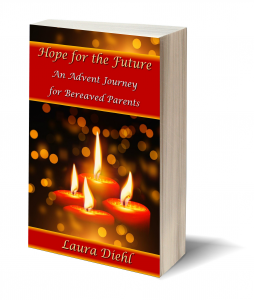 Every year, the four Sundays before Christmas, author Laura Diehl, has a live Facebook time with bereaved parents, lighting an advent candle and bringing a word of encouragement within the pain of not having our child during the holiday season. If you would like to participate, click here to register. 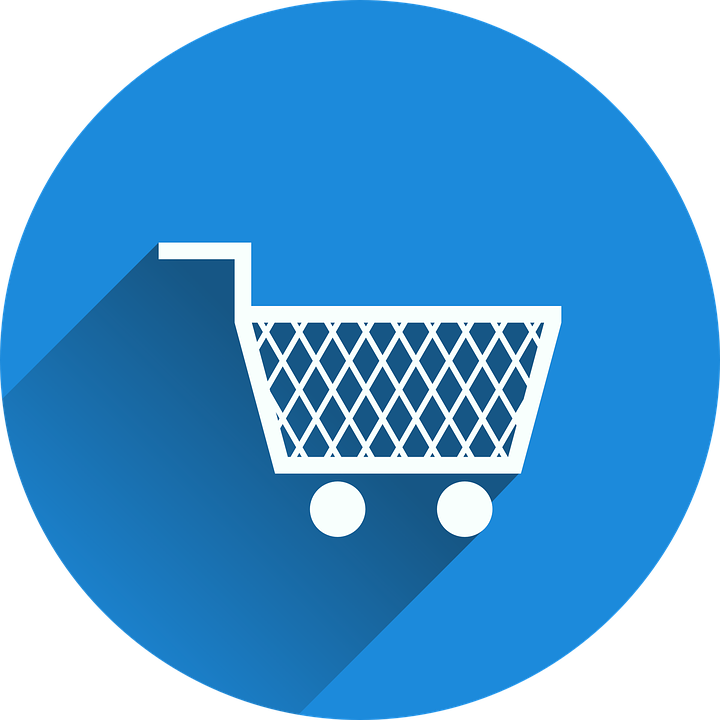 Once you are registered, you will be sent the detailed information, along with a little extra something from us here at GPS Hope.